The pygmy geese are very small perching ducks that occur naturally in Old World tropics (Old World = Europe, Asia, Africa). They inhabit still freshwater lakes. 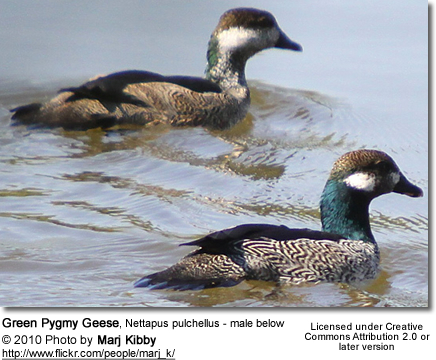 They are the smallest of all wildfowl. Green Pygmy Goose Nettapus pulchellus of northern Australia and southern New Guinea. 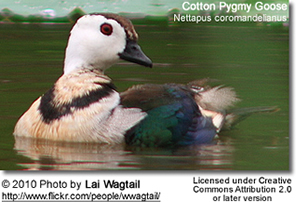 Cotton Pygmy Goose Nettapus coromandelianus of Southeast Asia. African Pygmy Goose Nettapus auritus of sub-Saharan Africa. 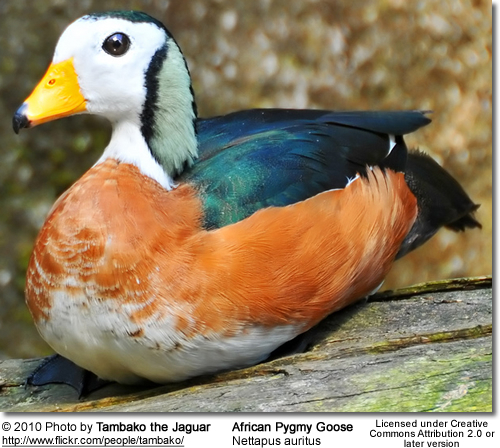 Pygmy geese have a rufous-colored chest, white abdomen and face, glossy-green upper plumage,and light-green sides of the neck. They have short bills, rounded heads and short legs. Pygmy Geese mostly nest in tree cavities. 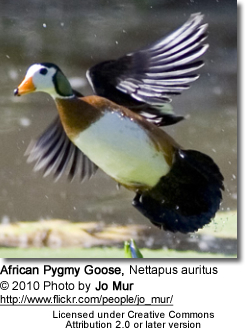 Pygmy geese feed on seeds and other vegetation, particularly water lilies.